Folder Organizer – Tidy smartphone, tidy mind! Users who tend to download a steady flow of applications and have an address book that's jam packed with contacts know that a tidy house, er, smartphone, equals a tidy mind. And this goes double for users for whom surfing the web is second nature, especially when icons and links are threatening to permanently take over the homescreen. Luckily, there are a few dependable apps available that will help you keep your Android device tidy and easy to navigate. Folder Organizer is one of them, so let's take a look. It doesn't take long before the 2,06 MB file is installed and an introduction manual flashes across the display. With the 3.5 version of Folder Organizer you now also have an option of downloading labels for already installed apps, making it fast and easy to reorganise your application repertoire. 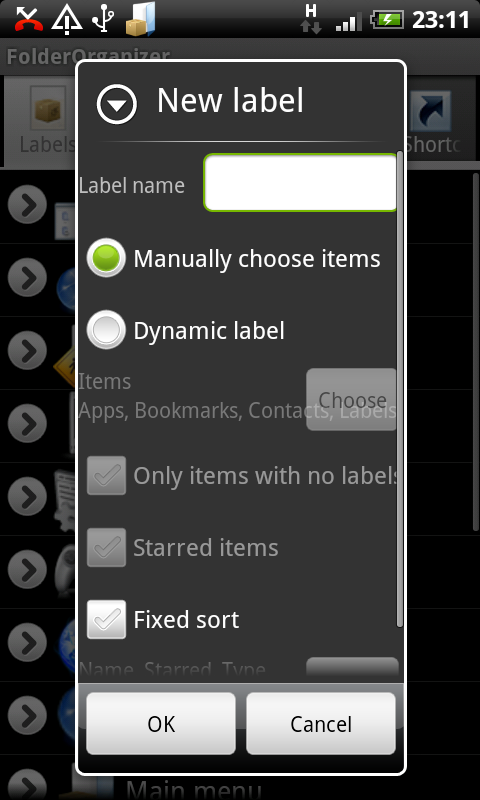 Labels: This is where you can see which labels have been assigned to which folders and apps. Hit the drop down menu on the left to display the apps contained within a given folder. The drop down menu on the right hand side lets you manage the folder, select another icon for it, rearrange the apps it contains, share the folder, add new labels, change the layout or simply delete the folder altogether. Use the + symbol on the top right to add a new label; to rearrange a label, look to the right of the + symbol. Search: Use this feature to search for apps, contacts, etc. Apps: All available applications are listed here. Again, there are drop down labels with which you can change the labels or icons associated with an application, rename an app, share it, deinstall it or have it displayed in Google Play. A cool feature: all labels associated with a given application are displayed beneath the app. Bookmarks: Again, use the drop down menu to manage your bookmarks, share them or change their icons. Contacts: Manage your contacts and add labels to them. Links: Create and manage links. Phew, now let's take a look at how the theory pans out in praxis. New widgets can be attached to the homescreen in a jiffy. These widgets act as folders for your apps. There are several options for organising your folders: widgets come in several sizes (4x1 – 4x4) and entries and links can also be added. Once you've selected a widget, use the labels to select which app is to be displayed. Check out the widget settings should you wish to make changes to the appearance. Change the theme colour, make changes to the layout, and more. All of these changes can also be made after a widget has been installed, via an icon in the folder or toolbar, depending on where you opt to place it. Another option is to create sub-folders within the widgets, thus maximising your organisational potential. The fact that the widgets can all have a distinct look really helps you keep a good eye on the state of your homescreen. Alternative launcher users (e.g. ADWLauncher EX or GoLauncher EX) may select whether widgets be scrollable. should you wish to make an entry, select from the following options: apps, bookmarks, contacts, cirect call, direct text, direct e-mail and link. Use this option should you not wish to create a widget but are looking to link a particular folder that was previously created using Folder Organizer to your homescreen. Icon packs can also be used at this point. Folder Organizer can also be used to find new icon packs. Folder Organizer packs a punch when it comes to helpful features, so much so that it may feel a bit overwhelming for some users when they first start navigating the functions. Fortunately there are some great tutorials available on the developers' website, and the intuitive controls (once you've understood how to use them) make navigating the app relatively easy. We love that it is possible to access the settings at different stages and from lots of different positions. I've been using Folder Organizer for a good while now, and its never let me down so far. I can't detect any negative effects on the battery or system software. Folder Organizer costs only 99 Cents which, to my mind, is more than a fair price, considering just how much this application has to offer. 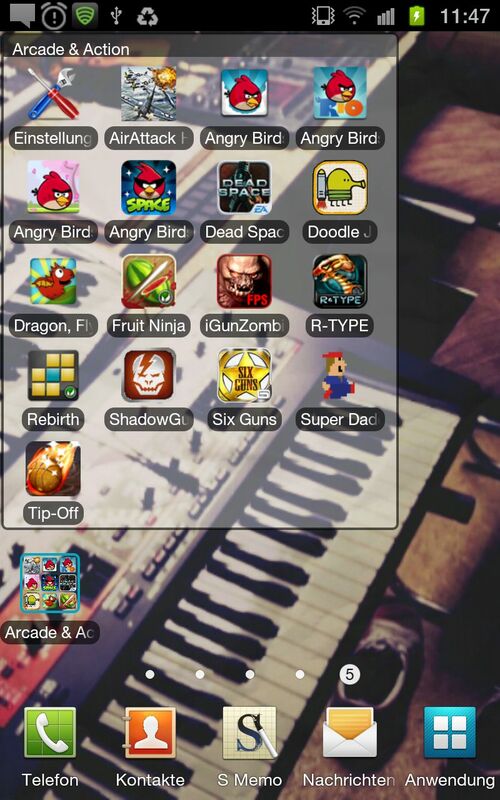 Then again, a few very good free apps are equally available, which is worth bearing in mind. A free version of Folder Organizer that comes with less features can also be tested. 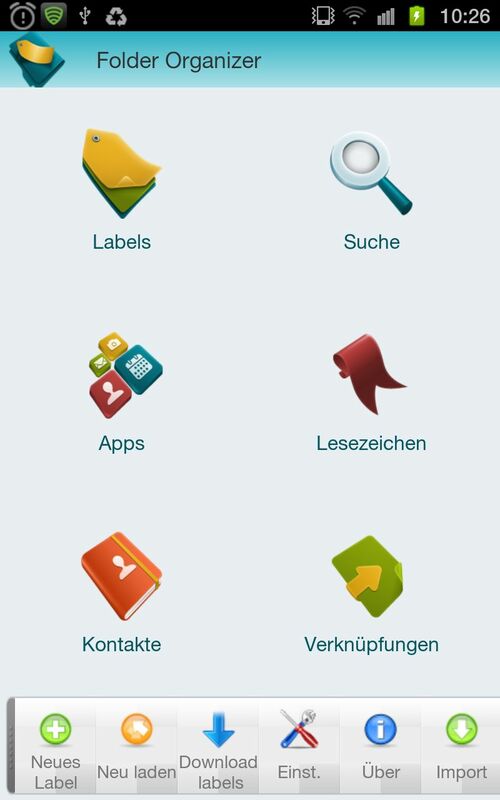 As our app of the week, Folder Organizer is available for only EUR 0,49. @mandi phillips: There is no voucher code, the app is available for only 49 Cents all week, but only from the AndroidPIT App Center. There's also a free version that has less features. One thing I miss is search functionality in the main menu.